Thanks for stopping by the Eide CDJR Pine City financing and automotive loan page. 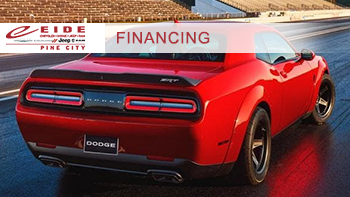 As the leading provider for new and used Chrysler, Dodge, Jeep, and Ram cars in the Pine City region, we make it a point to also offer up a top-tier approach to helping you get the financing you need to drive home in your dream car. Ready to hear a little more about what we can do to help you start the process of getting financed and behind the wheel of your dream car? Then take a moment to connect with the finance team here at Eide CDJR Pine City, so you can garner a deeper understanding of how we handle everything from bad credit problems to new car loans. After covering all of the info here, we are positive you will be ready to set the wheels in motion of driving home in the Chrysler, Dodge, Jeep, or Ram vehicle that piques your interest. 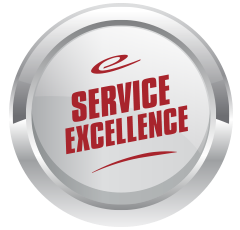 For just a second, we want to bring you up to speed and explain exactly why coming to Eide CDJR Pine City is the best call you can make when it comes to getting your hands on a new Chrysler, Dodge, Jeep, or Ram vehicle in Pine City. The overarching theme here is that while other groups and third-party financial outlets might boast they are capable of taking care of all your new car loan needs, only our group of financial staff members are able to back up these significant claims. Strong Bonds with the Best Lenders — Making powerful inroads with the most trustworthy organizations from Pine City to the opposite end of the country means you have the luxury to choose from a variety of alternatives as you uncover the best loan. 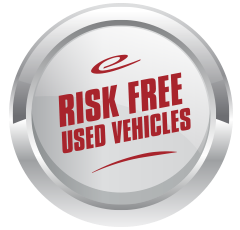 Willingness to Fight for the Right Financing Agreement for You — At times, working out the most consumer-friendly terms on your car loan requires an aggressive approach on the negotiation process. Thankfully, our team is ready to fight on your behalf and work out a contract that always puts your needs first. A Long-Running History of Happy Vehicle Loan Customers – By laying claim to a significant amount of automotive industry success on our side, you can trust firmly in the notion that the entirety of our finance staff has what it takes to successfully lead you through this sometimes hectic and multi-faceted happening. By now, there is no debating Eide CDJR Pine City is the most trusted source when it comes to connecting you — and the best car loan to go with it. Can I Apply for Financing with No Money down? Receiving financing without paying a penny up front is one of the myriad specialty services provided at Eide CDJR Pine City by our financing group. Taking it a little further, adding in the option to drop payments for anywhere between 30 and 60 days is also available when opting for no-money-down car payments. To make this deal happen, we do require some additional info from you pertaining to your financial considerations. If you are interested in what it takes to get the ball rolling on this front, take a moment to talk with our team of trustworthy auto financing professionals when you can at (877) 668-3180. Facing down low credit as a car buyer in Pine City is clearly a situation that can reduce your fun as you search for the right car. However, by making it a point to bring your business to Eide CDJR Pine City, you can say goodbye to the bad credit blues and get back on track for driving home in your dream car, truck, or sport utility vehicle (SUV) today. Yes, having low credit is an issue. Regardless of this realization, Eide CDJR Pine City understands this issue is not always something that can be boiled down to a single factor or number. By doing this, we have set a standard of commitment and empathy for customers with bad credit that is incomparable in Pine City — and served countless car buyers as they work through this tough situation and find the best vehicle for their personal daily agenda. Of course, each shopper has unique considerations and comes from his or her own particular situation, so it makes plenty of sense to connect to the financing department here at Eide CDJR Pine City by calling (877) 668-3180 first before you set aside some time from your busy schedule and sign off on an appointment. How Do I Begin the Process of Getting Financed? By this point, it is time to begin working on the process of figuring out the best way to set up a car loan for a wonderful new or used Chrysler, Dodge, Jeep, or Ram from Eide CDJR Pine City. Because of this reality, we would like to ask that you take a couple minutes of your day and complete our easy and safe auto financing application by pressing the button below. Once we get our hands on this data, our tireless credit and loan team will start compiling information related to the loan offers available to you. 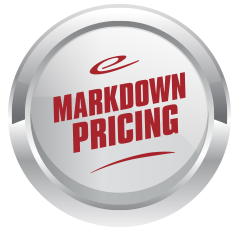 From here, we will reach out and bring you up to speed on how to get the best possible outcome out of these exemplary pricing deals. Thanks again for visiting Eide CDJR Pine City, and we cannot wait to pair you up with the best car financing deals in Pine City and its connected regions soon!